Dr. Steward: Would an enema help? "Dear God! What ARE you doing to the furniture?!" I remember being an 11 year old boy in stitches with laughter when I first viewed this film on new release VCR (yeah, video - old school)! Having just watched this film again recently I have to say that it's still just as funny as it was as a child. The film of course is a parody on the 'Dracula" mythos and the jokes and gags are much better understood if you've watched films such as "Bram Stoker's: Dracula" which I can't watch seriously anymore cos' I constantly think of this film in certain scenes and start laughing! The cast is brilliant in their roles especially Leslie Neilsen as "Dracula" and his brain-washed slave "Renfield" (Peter MacNicol) portraying an insane, insect eating madman extraordinarily well! The humour is all in the typical Mel Brooks 'tongue-in-cheek' style and also quite reminiscent of Monty Python in parts, the over-the-top British accents may attribute to that part. 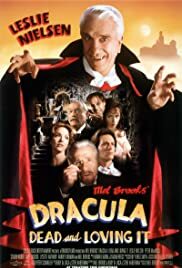 The final film directed by Mel Brooks, "Dracula Dead and Loving It" is very entertaining and the mindless humour make for a very enjoyable spoof movie!